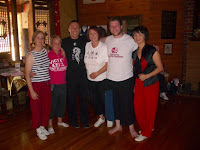 I've just come back from 4 days of intensive training with my teacher, Chen Yun-Ching, at the Wu-Lin Retreat in Victoria. The official course was held from 7 to 10 January 2010. I flew out on the midnight flight of the 6th and managed to grab 3 hours sleep on the 3 1/2 hour flight (I told them not to serve me dinner and breakfast!). My flight landed at just after 6 am and just over an hour later we pulled into the driveway at the Wu-Lin Retreat. No sooner had I put my bags down than I saw Master Chen, who beckoned me onto the floor for Chung Yang Sword practice (James and Master Chen's niece, Xiao Yi, were practising a tiger hook sword form). A couple of hours (and some considerable sweat soaked into my long trousers and shirt) later, I thought I'd have a shower and lie down. Master Chen was going into town and would be away for most of the afternoon. However as luck would have it, my good friend Bill Mioch turned up and asked if I wanted to revise the xingyi kun (the staff form of xingyi). 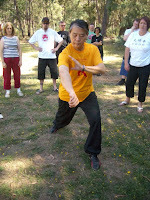 So for the next 3 hours we practised this form until Master Chen returned and more training ensued under his supervision. We also did 9 san shou (2 person fighting drills) with qin-na (locks), push hands (single, listening hands and the peng liu ji an sequence with steps and turns), and some freestyle push hands too (my "uncle" James sure is one tough guy)! As temperatures soared into the low 40s (Celsius) I sweated through about 6 t-shirts and drank several gallons of water (and several gallons of beer, wine and James' Serbian slivovitz/rakia at night!). One of the things I love about Wu-Lin is Shou Mei's Taiwanese cuisine: it suits my stomach perfectly, and there is always more than you can eat. 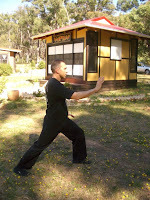 Of course, I can't mention training at Wu-Lin without referring to all my friends there who I have come to love and respect: James Sumarac and Shou Mei provide a very enthusiastic, hospitable environment that "rubs off" on all who go there. 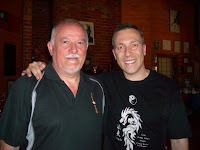 I was very happy to see my Chen Pan-Ling brothers and sisters, John Forza, Bill Mioch, Vicky, the two Lyns, Graham, Darren Sampson and Roy Harding. In addition there were other Taiwan veterans namely Glen Cannon, Geoff and Pauline and the irrepressible Katie (who did a marvelous job assisting Shou Mei in the administration and management of the meals etc.). Then there were the other "regulars" at Wu-Lin - Dave Ramsay, James Murphy, Eric and many others. I was impressed to see a new building on the grounds - an elegant tea room that was dedicated to Master Chen with a plaque erected on the final morning. I started the course with a significantly swollen knee (among other aches and pains) caused by my immune-related illness, but curiously this resolved over the (intensive) training so that by the last day I was able to go into the deepest postures with only a modicum of discomfort. 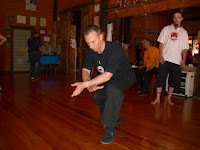 I have found this on each occasion I've trained with Master Chen and I can only put it down to the movements "flushing" the rogue immune cells from the synovial tissue around my joints. If ever there was a testament to the health benefits of the internal arts, then this is it - along with the fact that Master Chen (who is 71) is an outstanding advertisement for his art: Watching him effortlessly fall into the lowest postures and jump high into the air, I am continually made aware that his body is healthier and "younger" than mine! We trained for the usual 8 hours each day, however on this occasion I resisted the urge to keep practising after dinner - mostly because of the heat and the desire to keep sweat-free after my shower, but also because the course comprised mostly revision; the imperative to memorise new material simply wasn't there. And so, on the last day I was quite content to take a bit of a back seat and watch the demonstrations, including a very impressive display of the "Iron Fan" form by Master Chen's talented niece, Xiao Yi (who is a highly respected teacher of taijiquan and other Chinese arts, living in Kyushu, Japan). I was pleased to see my own student, Dave Ryan (who recently moved to Melbourne) making the trip up to visit for the afternoon. 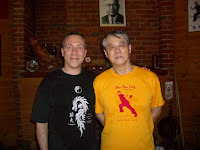 Late that night I said my goodbye to Master Chen, promising to practise and preserve the material he had so patiently and thoroughly taught me, my body sore and tired and my brain fulled to the brim with details and memories. 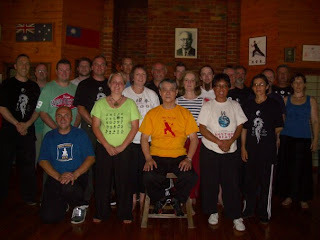 I plan to fulfill my promise to Master Chen - starting with a series of seminars introducing his arts to the Western Australian public (the first being an introduction to his father's xingyiquan on 31 January 2010 - see here for details).